Even though the next New York Comic Con is a year away, I thought it might be a good idea to jot down a few of my recommendations for future con goers while they’re fresh in my mind. Not all of these pointers will apply to everyone, and some of them are just plain common sense, but if they help you out, then I’ve done my job. Wear comfortable shoes, or your world will be a constant agony beyond description. My recommendation would be sneakers. If you’ve got more than one pair, switch off between days. There’s lots of walking and waiting on lines to be done, and if you don’t wear shoes that keep your feet happy, they will turn on you. If you’ve got the money, I’d consider gel inserts for extra squishy. If you’re bringing a bag, make sure it’s a two-strap backpack with lots of shoulder padding.Take it from me, wearing a shoulder bag is a BAD IDEA because it will murder your back and leave you with a tennis ball-sized knot in your shoulders. Bring a bag that will evenly distribute the weight of whatever you’re carrying. Bring your own food so that you don’t have to wait on the horrendous lines at the food court or pay exorbitant prices. Also, unless you prefer surviving on cold hot dogs and stale pretzels, whatever you pack for yourself will be much better than what The Javits Center has to offer. Shower every day, or you will contribute to the lingering reek of armpit that permeates the entire show floor. Be part of the solution, folks, not the problem! Buy your ticket in advance. If you know you’ll be attending Comic Con, buy your ticket before the deadline so that you can have it shipped straight to your door. This will save you loads of time on convention day when those who don’t have their tickets are waiting in line. (There are plenty of lines inside for you to wait on.) It’ll also guarantee that you get a ticket, before they sell out. Arrive early on Friday, because the line to get into the con will wrap around the building (and it’s a really big building). Even if you bought your pass ahead of time, you’ll get stuck waiting, so arrive as early as possible so that you’ll be one of the first people inside. Bring a water bottle. There are plenty of water fountains around, usually outside the rest rooms, where you can refill your water again and again. (It’s not a bad idea to mark these on your map.) If you try to buy a drink there, you will pay almost five bucks for a 20 oz. bottle of soda, and it won’t hydrate you as well as the water. Make a plan of attack. The schedule for Comic Con usually comes out a few weeks before the con itself, so you’ll have plenty of time to look it over and decide which events interest you most. They even have a handy show planner that you can use to keep track of your events, and an app for Android and iPhone that’ll keep you on track while you’re at the con (although I’ve heard this isn’t as useful as it could be). Leave at least half an hour between events, especially on Saturday and Sunday when the con is more crowded. Just about everything has a line, so if you’re planning on dashing from one panel to the next, you’ll probably get closed out. If you’ve got two panels or events that are back-to-back, pick which one you’d rather go to, and don’t be afraid to leave before the panelists wrap up. Don’t wear a costume that won’t fit through doors or on escalators. Make sure you can climb stairs, too. This year, there was a guy who wore an awesome Bumblebee Transformers costume, but he caused a huge bottleneck everywhere he went because it was so ginormous. Also, he looked like he was about to fall to his death every time he tried to ride the escalator. Don’t take a taxi. If you choose to do so during the rush to get to the con, you will be caught in the worst backup imaginable as the cabs bottleneck on every single street leading into 11th Avenue. The Javits Center is only a short walk away from Penn Station and the 1-2-3/A-C-E trains, so start off your day of walking with a little more walking. If you’re coming from out of town and you’ve never been to New York before, make friends with Google Maps and figure out a good route beforehand. The train ride home on Friday, Oct. 14. 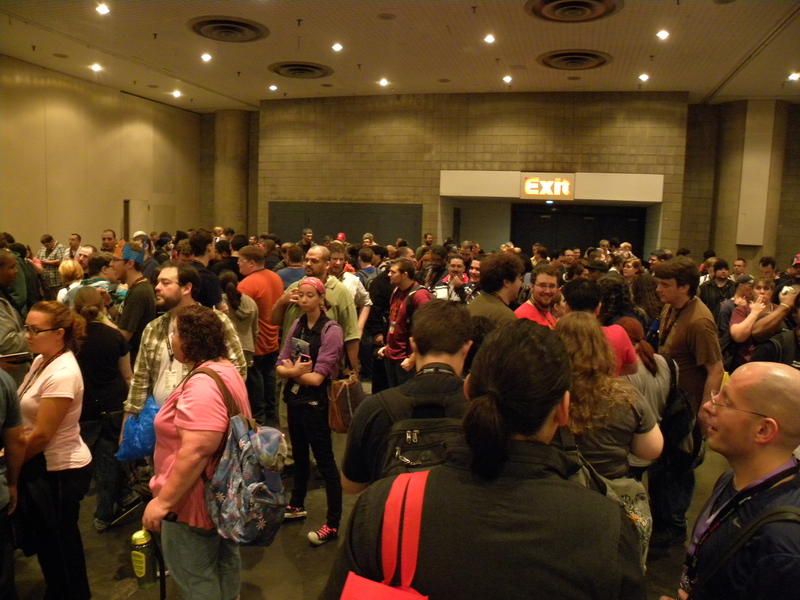 Don’t be upset if you are shut out of a panel you spent hours waiting on line for. Chances are, it’s going to happen, especially if it’s the kind of thing that everyone wants to go to. There are tens of thousands of people in attendance each year, and in my experience, the volunteers who manage the lines do a pretty crappy job of it, so things get pretty dicey when it comes to who gets in. If you let the disappointment of being closed out get to you, it could ruin your whole day, so try to take it in stride and move on to the next fun thing. There are plenty of ’em. Don’t bother arriving before the doors open on Saturday and Sunday. If you’ve already got your pass, you can just walk right in, so don’t sweat it if you’re a little late. Don’t bring unnecessary things, especially if they’re heavy. I told myself that I’d read on the train, and took along a big, heavy role-playing source book that I’ve been trying to get through. Let me tell you, that thing was the bane of my existence for two days before I finally decided to toss it out of my bag. Only take the bare essentials; your spine will thank you for it. Don’t go up to the mic during an audience Q&A just to say something that will make you sound like a complete douche bag, even if you are a complete douche bag. No one else came to the panel to listen to you talk, and everyone will hate you forever. Also, if your question requires a 10-minute explanation, make sure it merits taking that time away from others in the Q&A line. If your question requires that much introduction, consider asking the panelist afterwards. Don’t stop walking in the middle of a crowded hallway or on the show floor, even if there’s something really awesome that you want to take a picture of. Step to the side so that you’re not blocking traffic, and so that you don’t get trampled by angry nerds. Don’t try to meet your friends on the show floor. Pick a meeting place on one of the lower levels, where it isn’t too crowded. Unless, of course, you happen to be a.) exceptionally tall or fat, b.) dressed in a ridiculous or brightly colored costume, or c.) you happen to be carrying a bullhorn.